PUNXSUTAWNEY—The long-awaited time has come for this year’s VFW Teener League “Ultimate Ticket Giveaway” raffle tickets to go on sale. The 2002 winners Tony Adamczyk and Tom Berryhill, they will tell you that buying a ticket is well worth the investment. Tickets cost $20 each, but odds of winning are one in 1000, according to Adamczyk, which. The VFW ticket raffle grand prize winner is allowed to choose his or her .favorite from a list of ten prizes that includes an elk hunt for two in Colorado; a Polaris Sportsman 400 4×4 four-wheeler; a trip for four to Oahu, Hawaii; a trip for four to Disney in Orlando, Fla.; a Caribbean cruise for two; a trip for four to Las Vegas; a trip for four to Cancun, Mexico; a trip for four to Vail, Colorado; $100 per week in groceries at County Market, and $3500 in cash. The winner. Bill Clement, chose the trip to Hawaii, but Adamczyk and Berryhill, who had each paid for half of their ticket, said their choice was obvious. The prize package that got their adrenaline pumping was the hunting trip to Colorado, and they had such a great time that they are already planning to purchase raffle tickets this year, in hopes of winning the trip again. 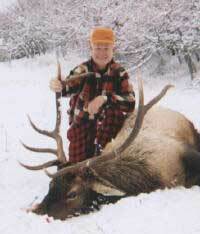 The outfitter for the trip was Jay Mitchell of Action Adventures, and the two men said that he is a great guide. Adamczyk said that Mitchell is “one of the best,” and that people often have to book hunts with him three years in advance. What made the five-day hunting expedition so successful? Certainly, part of it had to do with the snow-covered mountains of Colorado and the vast expanse of wild scenery. The men said they were hunting at approximately 9500 feet up in the mountains, some of which towered, they said, another 4500 feet above them. This can cause some tricky weather. Adamczyk said, somewhat amazed, “We had lightening and thunder up there at that time of year.”There was no snow on the ground when they arrived at camp, continued Adamczyk. Conditions changed rapidly, however. “When we got up, there was 1-1/2 feet of snow.” While seeing the blanket of snow appear, literally, overnight was exciting, it did not begin to compare to the thrill of the hunt. Berryhill said that he was impressed with the snow he saw when he awoke after sleeping that first night in camp, but that seeing a herd of 20 to 25 elk walking by first thing in the morning was the most exciting moment of the trip for him. In the Colorado mountains, this is not the case. Mitchell led the hunters to a place he thought would give them the best odds of encountering wild elk, and the gentlemen waited there for their game to arrive on the scene. 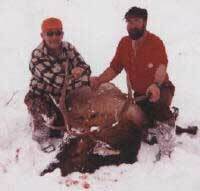 While there were no guarantees either of them would bag an elk, Mitchells’ reputation was apparently well-deserved, and Adamczyk and Berryhill both got their quarry, taking home and estimated 180 pounds of meat each for their tables. They have already booked another hunt with Action Adventures, and will be paying out-of-pocket to go this fall. This shows just how much they respect the organization, and how much ‘they thought of their outfitter. Even if they had not won, Adamczyk and Berryhill said, they would say that buying a raffle ticket is worth the money. “It goes to a good cause,” said Berryhill.